New York - Four months after Haiti was hit by a devastating earthquake, which claimed over 200,000 lives and left 1,000,000 homeless, the mission of the Russian Orthodox Church Outside of Russia on the island continues to struggle with the difficult reality of rebuilding their lives torn apart by the disaster. Recently the mission’s administrator Fr. Daniel McKenzie traveled to Haiti to check on the mission’s progress. “I was impressed with the overall situation despite the destruction and all the suffering the people have endured and continue to endure,” Fr. Daniel reported to the Fund for Assistance. “Everyone was feverishly working, very active and hopeful, especially now that the FFA, IOCC and other organizations are helping them. The whole country is enlivened, understanding that they have a new life ahead of them”. Considering how much the country has to deal with, the mission’s progress is extraordinary: a church has been rebuilt, the priests bought two SUVs so they can visit their parishes around the country; two parish schools have reopened; rent on church buildings has been paid, etc. The overall situation remains difficult as over a million people are still living in tents without access to water or electricity. Unemployment continues to stand at 85% and people try to survive any way they can without jobs, income and hardly any help from the government. Fr. Daniel says that, with the support of donors, mission members may now be able to fulfill their dream of buying some land to build a church. Fr. Jean Chenier-Dumais, the rector of the mission in Haiti, has already had the Nativity of the Theotokos Church, which sustained heavy damage in the earthquake, reconstructed and services restarted. He is also rebuilding the four-story school he directed before it was pancaked by the quake. The new school will be earthquake-proof. Although there are no school buildings yet, two parish schools have reopened: the Foyer d’Amour School (Fontamara) for mentally and physically handicapped children directed by Fr. Grégoire and Matushka Rose Legouté, and the Notre Dame des Petits school (Port-au-Prince) directed by Fr. Jean. Classes are being held in tents or under tarp. There are no books or school supplies but no one wants to wait. 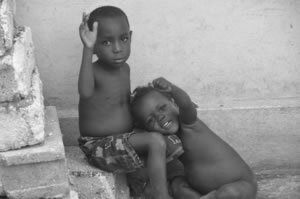 Children in Haiti have been so traumatized by the earthquake that, in the words of Matushka Rose Legouté, they were scared by the smallest noise and afraid to leave their parents’ side. “With the opening of the schools, the children got a schedule and a feeling of normalcy to their day,” said Matushka Sophia McKenzie, who is in close almost daily contact with the mission. With the destruction of their schools and churches, and the death of several parishioners and one reader, the earthquake set the mission back at least a decade. Port-au-Prince is a city of low two-three story buildings, bare gray walls and 90-degree angles. The architecture here, Fr. Daniel says, is very much lacking in the word “beauty”. 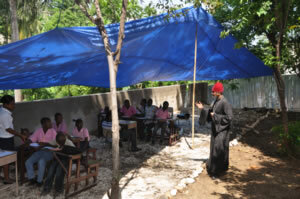 Orthodox Churches are quite simple – the Nativity church in Port-au-Prince is a basement with four walls and a roof. In their dreams, members of the Haitian mission see themselves praying in a beautiful Russian-style church with cupola and Orthodox iconography. “They have been inspired by the churches they saw in Washington, DC and Mayfield, PA on their last visit to the United States in March 2010”, said Matushka Sophia. “They think that something as ornate as the Russian churches in the U.S. would convert people. That is what they want more than anything: to be able to show the beauty of Orthodoxy. The priests want people to be able to see right away that it’s not some Protestant establishment, but an Orthodox environment”. What draws Haitians to Russian Orthodoxy? In a country where 80% of the population practice Catholicism in some form, and 16% – Protestantism, converting to such an exotic-sounding religion as Russian Orthodoxy sounds unlikely. For Fr. Daniel, interest in Russian Orthodoxy seems to stem from more than mere curiosity. Editorials, internet chats and even the news around the world are still full of angry wondering about why God allowed the earthquake and subsequent suffering of hundreds of thousands of Haitian people. Fr. Daniel takes a different approach to the question concentrating not on “why” but on “what.” What can we do to improve the situation? “It is a tragedy for the Haitians, but it can be a great benefit for us, because God encourages us to be merciful. So if people never did help, maybe they should help now. 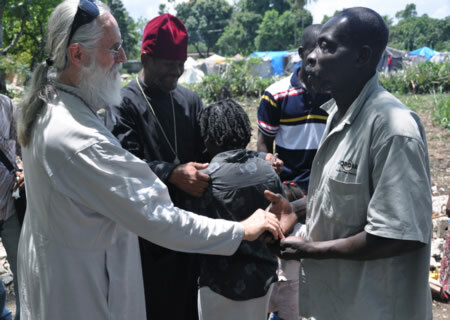 This opportunity is a gift from God to try to move us to compassion,” said Fr. Daniel. All photos courtesy of Serge McKenzie.